We thought we would open our vaults and offer the serious chilli head the opportunity to sample some varieties we have in our PRIVATE COLLECTION. 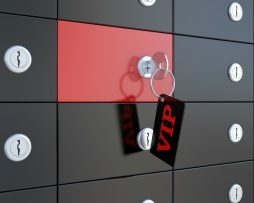 But please don’t order if you don’t like surprises and like to keep things predicable. 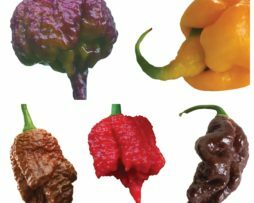 We have a range of chilli seed varieties that we love but for a number of reasons don’t offer them for sale on our site. SO WHAT WILL YOU GET? 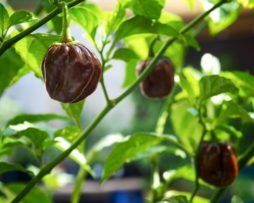 – you will receive one special chilli seed variety we can guarantee is either super rare / not yet available / simply stunning in it’s beauty / or one that is a not deemed stable but extremely cool and/or extremely tasty. But please don’t order this product if you are someone who likes to keep things ORDINARY. If you need something extra special for the ‘man cave’ or for the chilli-loving woman in your life, then you really should have one of our Super-Hot Limited Edition Chilli Posters! One of these on your wall will announce to everyone that you are indeed one of those special people with a mad chilli addiction! On a practical level, you can use it as a list! You can tick them off as you munch your way through some of the hottest chillies in the World. Or you can simply circle the last chilli you ate just as you pass out on the floor from that good old Chilli Burn. This will help the Paramedics enormously as they will instantly know how much milk to administer to you! Printed on the highest quality paper at only $28 plus Postage, you shouldn’t be without one! The 7 pot Barrackpore chocolate was given to us by a friend – we grew it out and just loved the shape, colour and waxy sheen. The pods are huge some growing to 8cm long and 6cm wide. We don’t have any background on this one other than it is said to be a natural variant of the Red Barrackpore. The original red variety is named after Barrackpore, a town in India. We are not sure of the strains stability but we will continue to grow this one ourselves into the future and see how it goes. Look at all this chocolate goodness but don’t be fooled this one is a hottie. We love a bleeding calyx on a good looking chilli and this one is certainly that. Fruit grow around 3cm x 3cms in size and are thick walled with lots of placenta. 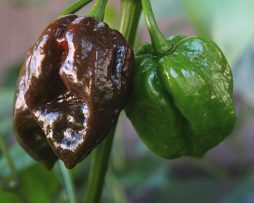 Its another naturally occurring variant of the 7 pot Bubblegum Red(a cross between a Trinidad Scorpion Moruga and a Trinidad 7 Pod Yellow) and we think it is hotter with more of a smokey aroma. Get your hands on this one for your rare chilli collection – you won’t be disappointed. This little beauty is definitely one for those who are collectors of rare and unique chillies. 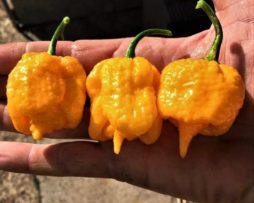 The Yellow variety is a naturally occurring variant of the 7 pot Bubblegum Red(a cross between a Trinidad Scorpion Moruga and a Trinidad 7 Pod Yellow) that we obtained from a friend. It is seemingly less hot than the red variety and the pods are about half the size at 3-4cms long and 2-3cms wide. It has the bleeding calyx that we all love and is quite prolific as chilli plants go. Taste wise it has the typical chinense flavour with a citrisy sweetness that bursts through. The 7 Pot Congo SR Gigantic Brown. That’s quite a mouthful and so is this great chilli! The pods from this bush are very large and very prolific. 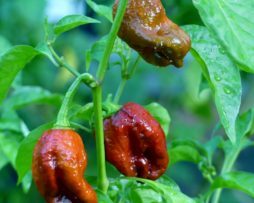 With that usual rich and earthy flavour that a lot of the brown super hots have, it will be more than enough for warming your food up to the level of “Am I the only one mad enough to eat this?” So with all the pods you have left over you can make your amazing chilli powder to amuse your friends…. Fun for almost everyone! 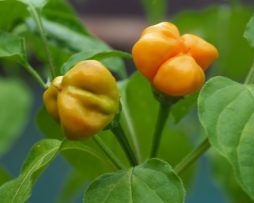 This chilli is still quite rare and we are lucky enough to be one of a very few that have it. Some people say the 7 Pot Rennie is a myth but after growing it we think it has its own distinctive characteristics – mainly its shape. 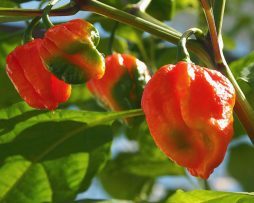 From our tasting it is one of the hottest 7 Pots and is also one of the best 7 Pot producers we have grown. Here is the background we found on this one anyhow. “A guy named Rodney got these from a friend named “Rennie”. Rennie is from Grenada. His wife is from Trinidad. Her parents collected these seeds in Trinidad (possibly Landrace) and gave them to Rennie. Rennie then gave to Rodney who distrubuted them to friends in the United States.” Confused well don’t worry we think you won’t be disappointed in this one. 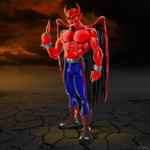 Check out Nigel’s review and decide what you think. 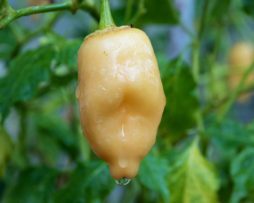 The Aji Peach Fantasy is probably our favourite Fantasy variety for taste. We think it has a real mellow melon flavour. Ours didn’t grow very star shaped but it was very sweet with a mild bite at the placenta like the other Aji Fantasy varieties. It has thick juicy flesh with a great crunch making it great to eat straight off the plant. The fruit start a translucent white then slowly ripen to peach. The bush does not grow large so it would be excellent in a patio pot. It sets masses of fruit for most of the year and did we mention it LOOKS GREAT Too. What an absolute ripper this one is. Created by the pepperlover crew this is the stumpy version that has all the same qualities as the original longer pheno type. 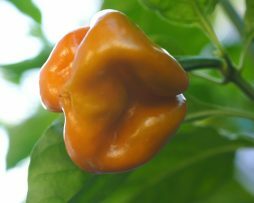 Crazy producer of 3cm x 1cm sized fruit/pods the Aji Mango will blow you away. Ripening to a deep bright yellow the fruit taste sweet and fruity. Yes as its namesake implies it does have a hint of mango like fruity flavour. As for what it would be good with we can only say SAUCE SAUCE SAUCE. But we have it on everything from pizza to pasta to salads. Do yourself a favour and grow this one. 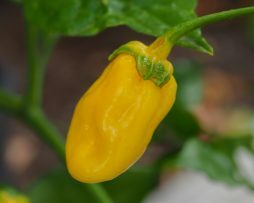 What do we have here, a yellow Aji Melocoton. First ever that we know of… Melocoton means peach in spanish so we should really call this one Aji Melocoton aka Amarillo. You can’t go wrong with baccatum’s for flavour and this one is very citrusy sweet with slight lemon undertones. 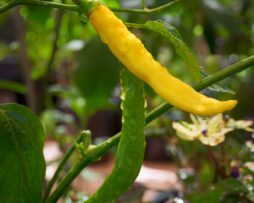 Originally created by Judy at Pepperlover why not be one of the first to grow the yellow variety. The plant grows tall and gangly, needing a good staking in its first year. Super prolific with non seedy fruit that change from green to a lovely yellow. We have grown it out twice and gotten the yellow variety each time but who knows you may even get another surprise colour.